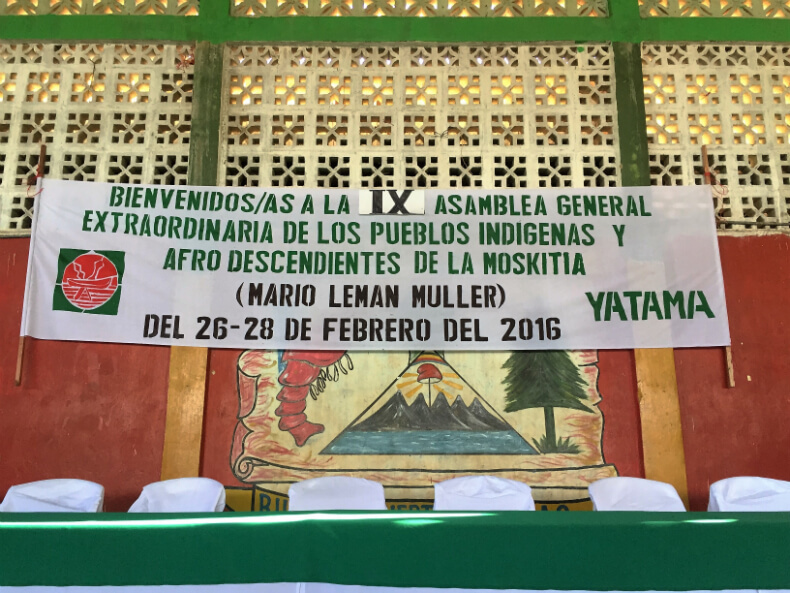 Main stage and banner at the YATAMA conference in Bilwil, Nicaragua in February of 2016. Photo by Courtney Parker. 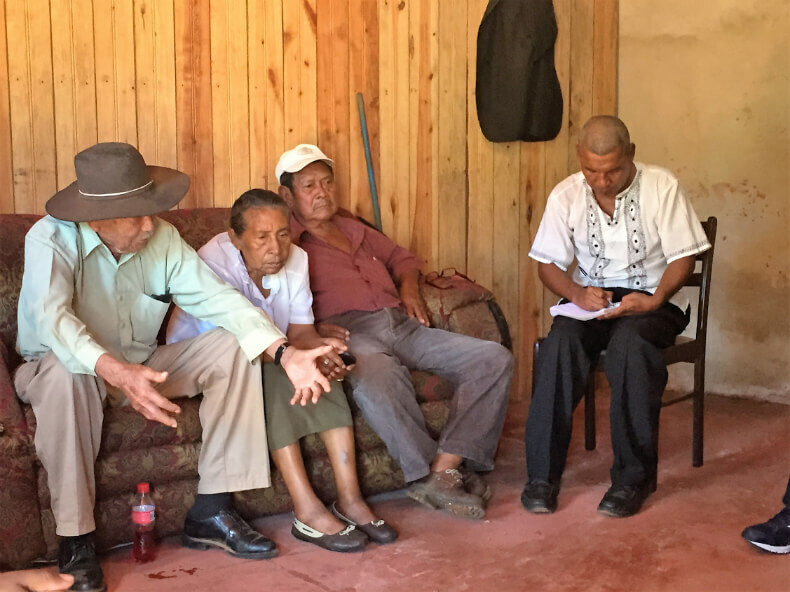 Earlier this year, journalist and University of Georgia College of Public Health PhD candidate, Courtney Parker, traveled to Nicaragua to conduct exploratory research and investigative reporting on the Indigenous Miskitu of the northern Caribbean coast. Assuming she’d end up covering the highly publicized struggle around the proposed Nicaragua Trans-Oceanic Canal, Parker was surprised to encounter an almost wholly unpublicized struggle playing out in the binational autonomous region of Muskitia. It was February of 2016 and the Indigenous political party, YATAMA, had organized a conference inviting Indigenous Peoples and their supporters from all over Nicaragua (and in some cases beyond) to gather and discuss collective solutions to the violent conflict that had infected the region. Heavily armed, illegal settlers referred to as “Colonos” have steadily ambushed Muskitia under a violent siege; and everyone had a story to tell. As with any political gathering of diverse groups, blame was thrown around, unifying points were rallied upon and whether anything was actually accomplished mostly depended on one’s personal perspective. Parker attended a whirlwind of conference-inspired meetings, both with supporters and criticizers of YATAMA. After feeling she’d heard enough diverse perspectives in that circuit, she joined a group traveling to the frontier region led by the secretary of the Miskitu Council of Elders (not affiliated with YATAMA). 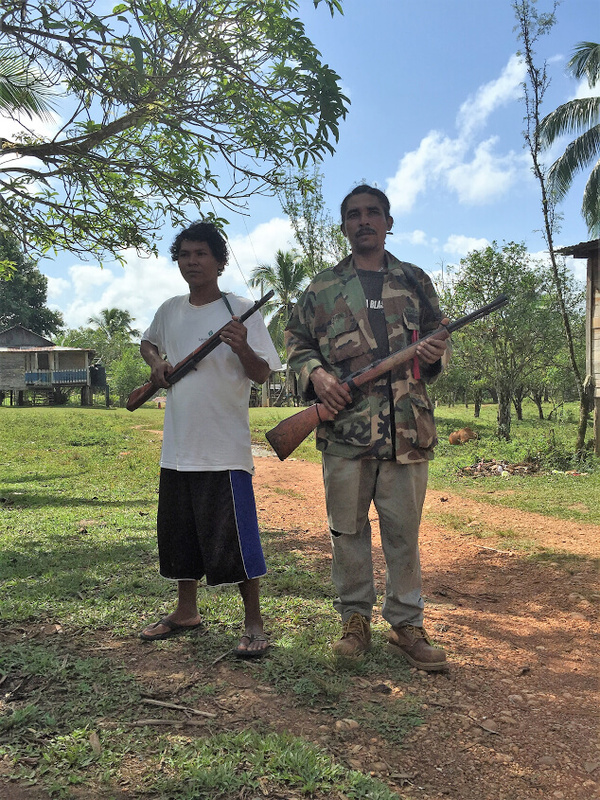 Two Miskitu community defenders pose for a picture in the frontier community of Wisconsin. Photo by Courtney Parker. As with any sociopolitical movement or paradigm, the further people are from the center of it, the more critical they tend to be. And as such, it turned out the people on the marginalized frontier – the region where the conflict has manifested at its most violent – were disgusted with just about everyone: local Indigenous leaders, the Sandinistas, Nicaraguan President Daniel Ortega, the international human rights community for not recognizing their struggle, the media for not publishing enough on it, and of course, and by far most, the actual Colonos. Upon returning to Bilwi, Parker bypassed any subsequent conference proceedings and focused on meeting with the refugee population from the frontier regions who had been forcibly displaced by the violence. She heard stories of children arriving without shoes and struggling to enter the school system, some speaking only Miskitu; their parents were often forced to go door to door begging for work from members of their extended urban community, many of whom were already struggling to get by. The mayor of the relatively small Indigenous city of Bilwi estimated they were currently hosting around 400 internally displaced Miskitu from this most recent conflict – with more arriving every day. 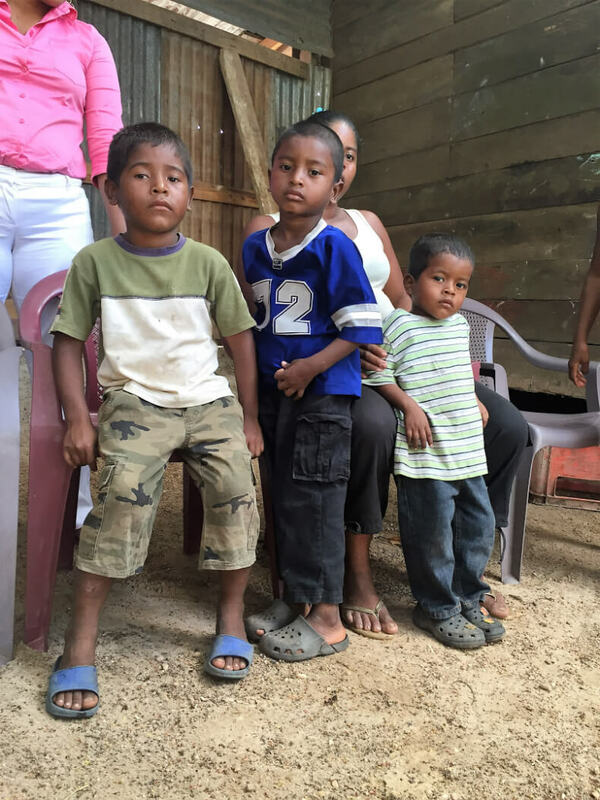 The Sandinista socialist government had provided no form of subsidies to date towards integrating these new arrivals into their social service system there; and, attempts to provide proper health and educational services to this population were floundering. Meanwhile, social services on the frontier had all but completely collapsed. Health workers and education workers were fleeing the escalating violence and the Sandinista government was not stepping in to effectively intervene. People were beginning to go hungry living under constant terror as Colonos routinely harass, abduct and murder Miskitu living on the frontier, even in instances where they are merely trying to tend their fields for food. Three young brothers and their mother, from a family with 6 children overall — IDPs who fled to Bilwi in August of 2015 from the frontier community of Santa Clara. Their family is struggling to get by in Bilwi; they are not used to needing money to survive. They don’t consider Bilwi their home and only wish for peace to be restored in Santa Clara so they may return to live in their traditional ways on their legal, traditional land. Photo by Courtney Parker. Steeped in the qualitative research methods tradition, Parker was familiar with the concept of “data saturation,” and applied it here. Data saturation occurs when data collected – in this instance, testimonies from a broad spectrum of Indigenous Miskitu individuals and groups, of various and diverse political affiliations and walks of life – generate similar themes over and over again to the point where one gains empirical confidence that certain themes are objectively present and cohesive. Among the themes that emerged in Muskitia were: beyond any subjective, individual or collective notions of blame or self-interest, Muskitia is suffering a violent, escalating attack by colonial interests; and, a resulting humanitarian crisis is producing somewhere between hundreds and thousands of refugees and IDPs (internally displaced peoples) attempting to flee their ancestral territory. Besides those who have recently attempted to resettle in nearby urban regions, there is a refugee camp in nearby Honduras currently providing sanctuary to as many as 2,000 or more Miskitu who have fled their homes and communities. Reports indicate one entire village picked up and left for Honduras together. There were claims from both YATAMA leaders, and YATAMA critics, that Sandinista soldiers had directly engaged in actual violence against the Miskitu. The historical context around this, is of an Indigenous autonomous territory resisting various forms of colonization, nationalization and invasion from the Sandinista revolutionaries, since at least the 1980s. Upon her return to the U.S., Parker and IC began running a series on the crisis in Muskitia. Parker began by publishing a photo essay about the conflict which focused on the extremely vulnerable frontier residents, in IC; and later, published a piece about the attacks on YATAMA and other resistance leadership by the FSLN, in Indian Country Today Media Network. These articles were both eventually republished by Truthout. Members of the Miskitu Council of Elders, and secretary Rosman Flores, gather in Bilwi to discuss their list of demands from the YATAMA political party in a private meeting preceding the YATAMA conference in February of 2016. Photo by Courtney Parker. Shortly after the pieces appeared in Truthout, Parker’s reputation and credibility were attacked by a crony Sandinista media outlet called Tortilla Con Sal. According to their own website, Tortilla Con Sal is an “independent” media outlet, yet they explicitly state their affiliation with the Sandinista political party. The Sandinista crony media outlet further accused her of omitting information about divisions in the YATAMA party, even though this was not discussed in the interviews she was reporting on and from – yet their implication was that she had done this purposely with the explicit intent of damaging the FSLN’s chances in the upcoming election. (Never mind the fact this would likely be an impossible task, since – as previously noted – Ortega and his wife are running virtually unopposed). The smear then digressed into a “recycling” of the overall divide and conquer strategy the FSLN has been aiming at Muskitia and the Miskitu people, dating at least as far back as the Contra Wars. It is noteworthy to mention, that many of the Miskitu fought alongside the Contras during this period because they were resisting the forced – and violent – nationalization of their traditional, autonomous, ancestral territory by the revolutionary Sandinistas. While their underlying struggle was wholly separate, and preceded this particular conflict altogether, their unique position at this point in time attracted the support of the Contras, the American Indian Movement (AIM) and the Central Intelligence Agency (CIA). The man at the front is a former Colono of Miskitu heritage who switched sides and began organizing the Miskitu to defend themselves after coming face to face with the carnage and bloodshed being inflicted by the armed Mestizo settlers from the interior and Pacific coast. 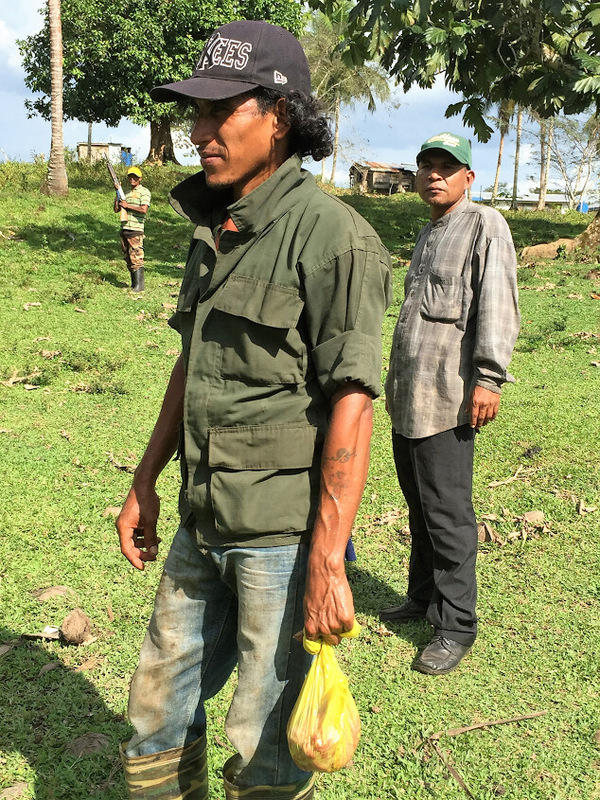 The man behind him is Rosman Flores, secretary for the Miskitu Council of Elders, who was shot and left to die by Sandinista soldiers while trying traveling to the frontier communities in September of 2015. Flores prides himself in serving as a link between the elders residing in Bilwi and the isolated frontier communities. Photo by Courtney Parker. The article by Tortilla Con Sal also accuses “Parker and her editors” of intentionally skewing the facts on the circumstances around Mario Lehman Muller’s death – when in fact, again, she was merely disseminating testimony from Miskitus on the ground in Muskitia who seemed to have been eye witnesses to, or in close proximity of, the actual events as they unfolded. The events in question apparently initiated when a group of YATAMA supporters began throwing rocks at Sandinista revelers during a callous celebration of Nicaraguan independence in Miskitu territory, that completely ignored the violent siege the Miskitu were suffering all around. According to reports collected in Bilwi, a group of Sandinista youth then escalated matters into more brutal violence; and, according to a formal report published by the Indian Law Resource Center – which includes names – a group of Sandinista affiliates and actual government officials began indiscriminately shooting and attempting to burn down the YATAMA community radio station. Among at least 9 other Indigenous victims, it was at this time Muller was shot, after which he died during an attempt to airlift him to lifesaving medical treatment. The Tortilla Con Sal article claims that Muller died of a heart attack on the way to the hospital but neglects to mention he was shot during the Sandinista attack first. For their criticism to hold any ground, they would have to be ready to prove that Muller was going to die of a heart attack that day anyways, regardless of having been shot in the attack. Muller was an extremely popular leader of the “Sanamiento Movement,” which is a collective movement attempting to drive out the violent, illegal colonizers; and, it emerged in the vacuum left by the lack of a systematic, resolved state response to the ongoing conflict. Again, the article accuses “Parker and her editors” of intentionally misrepresenting these events “and other related incidents and their context.” They baselessly and viciously tried to discredit Parker and accused her of failing to report “fairly and honestly.” Again, Parker was up front about her sources, and there is video evidence of the interviews that took place. 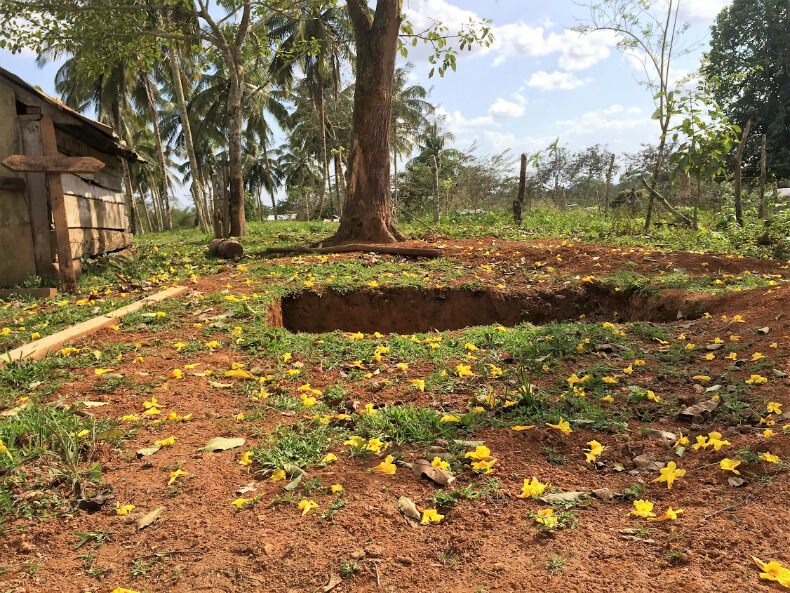 An open grave in the frontier community of La Esperanza, in February of 2016; Parker captured this image shorty after family members had arrived to collect the bodies following a vicious attack by Colonos that took the lives of two men, and pillaged most of the supplies left in the rapidly vanishing traditional Miskitu community. Photo by Courtney Parker. The attack on Parker’s reputation began in this Nicaraguan publication, but the Sandinista Nicaraguan state affiliates did not stop here. The libelous piece was then re-published by the state-funded outlet, “Telesur.” At this point, the smear on Parker “and her editors” went from national to international proportions. This was all too convenient for Telesur since their entire existence and underlying political propaganda cycle run on the steam of painting all critics of Bolivarian leftist state activity as “puppets of U.S. imperialism”. The original founder of Telesur, Aram Aharonian — who sought to establish a credible outlet for the sovereign expression of Latin American identity in the media — was in fact kicked to the curb in December, 2008, just a few years after its proverbial birth in 2005, at which point he claims it lost all integrity and became a full time propaganda machine for Chavismo. The Bolivarian left loves to employ a “look over there” strategy when it comes to respecting Indigenous rights – even attempting to appropriate them into their overall political platform – while the nation states perpetually violate the rights of Indigenous Peoples at their slightest nationalist whim. The Knight Center had previously reported on the Sandinista government’s alarming insularity from the media, the dangers presenting in Nicaragua surrounding the concentration of media ownership, and subsequent problems stemming from a lack of access to information in Nicaragua as a whole.